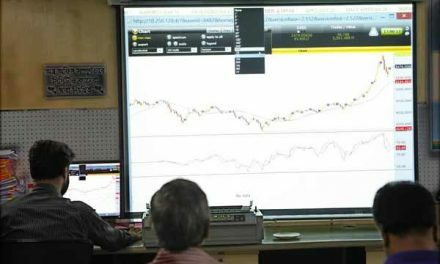 Dhaka, Bangladesh (BBN)-Bangladesh’s stocks witnessed roller coaster ride at midday on Sunday, the first trading session of the week. Both the Dhaka Stock Exchange, the prime bourse of Bangladesh, and Chittagong Stock Exchange, the port city bourse of the country, showed sliding attitude from the beginning and continued its negative trend at midday. The key index of Dhaka Stock Exchange (DSE) slipped 24.36 points, while the port city bourse, selective catagory index of Chittagong Stock Exchange (CSE) lost 31.90 points when the report was updated around 12:30pm. DSEX, the prime index of the Dhaka Stock Exchange (DSE), went down by 24.36 points or 0.55 per cent to stand at 4,384.28 points, when the report was filed at 12:30pm. The DS30 index, comprising blue chips, fell 15.32 points or -0.91 per cent to reach at 1,668.03 points. The DSE Shariah Index (DSES) also dropped 5.04 points or 0.47 per cent to reach at 1,060.95 points. DSE turnover stands at only BDT 1.38 billion when the report was filed at 12:30pm. Of the issues traded till then, 83 advanced, 165 declined and 53 issues remained unchanged. Jamuna Oil was the most traded stocks till then with shares BDT 106 million changing hands followed by Doreen Power, IBN Sina, Jamuna Bank, Power Grid Company of Bangladesh Ltd and Aman Feed. The port city bourse – the Chittagong Stock Exchange (CSE) also saw negative trend till then with its Selective Category Index- CSCX– falling 31.90 points to stand at 8,214.70 points, also at 12:29pm. Of the issues traded till then, 55 gained, 100 declined 34 issues remained unchanged with a turnover value of BDT 76 million.